H.P. Lovecraft's most revered novella, "At the Mountains of Madness" is going to be made as an animated feature film, "Mountains of Madness," produced by Upon Animation Studios and Lux Digital Pictures entirely in Canada. Production Art from "Mountains of Madness"
Stephen Sloan of Upon Animation Studios announced today that H.P. Lovecraft’s most revered novella, At the Mountains of Madness, is going to be made as an animated feature film, Mountains of Madness, produced entirely in Canada. The movie will be co-produced and directed by Sloan from a screenplay by award-winning playwright and screenwriter Peter Colley (http://www.petercolley.com). Mountains of Madness will be partially financed through an equity investment and distribution advance from Lux Digital Pictures and Executive Produced by Ingo Jucht (http://www.imdb.com/name/nm2104253/) with Tom Coleman Producing (http://www.imdb.com/name/nm0171233/) and with casting provided by Deirdre Bowen (http://www.imdb.com/name/nm0100831/). Aaron Vanek, recipient of the 2003 Howie Lifetime Achievement award for contributions to Lovecraft cinema and the director of the H.P. 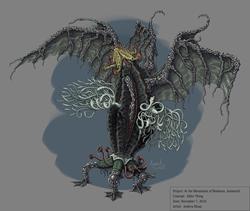 Lovecraft Film Festival & CthulhuCon Los Angeles, is serving as a consultant on the project. Over the years there have been numerous attempts to bring the Lovecraft novella to the big screen. It is a terrifying story about a doomed scientific Antarctic expedition that is hunted down and slaughtered by horrific creatures unleashed from the frozen wasteland. Its period, locations, horrendous monsters and unique story have presented significant challengers to filmmakers trying to make live action adaptations. The feature film version of this epic story remains buried – until now. The balance of the approximately 2.5 million CDN budgeted feature’s funding is expected to come from an investment by Telefilm Canada and a Canadian tax credit plus an initial, partial funding campaign on Kickstarter which is scheduled to begin in a June. Crowd funding rewards for participants will include a digital animatic, production and concept art, DVD, Blu-Ray and digital downloads of the finished film, premiere invitations and even a limited number of apprenticeships at Upon Animation Studios during production. The producers plan to start casting by the beginning of July. Various actors under consideration to voice the principal roles of Professor Dyer and Danforth are Christopher Plummer, Victor Garber, Elias Koteas, Nathan Fillion, Dan Aykroyd, Martin Donovan, Jay Baruchel, Justin Chatwin, Joshua Jackson and Hayden Christianson.